This week on The Bugcast: we talk pants, pods, podcasts; lament the loss of an amazing singer; and play 8 amazing tracks of Creative Commons music! 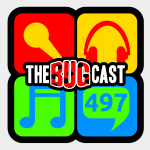 the bugcast 497 - What's In Your Head? The Independent: The Tide Pod Challenge: Do we really need to say this? Help us celebrate our upcoming milestones! The next show will be episode 498, which will be streamed live in the chatroom on Friday 26 January 2018 at 21:30-ish UK time (GMT/UTC).